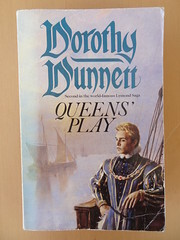 The second in Dorothy Dunnett’s Lymond Chronicles, and our hero is off to France at the behest of Mary of Guise to keep an eye on the seven year old Mary, Queen of Scots, without offending her inlaws at the French court of Henri II. With power, politics and passions all in play, not everything is as it first appears. A revisit to the Scottish Borders and the complex political manoeuvrings at play in 16th century Europe. 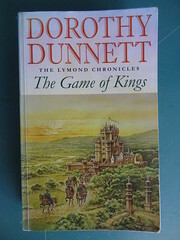 I originally read A Game of Kings, the first of Dorothy Dunnett’s Lymond Chronicles, in my third year at St Andrews – half a lifetime ago. I still love Lymond – who wouldn’t? Misunderstood underdog, stunningly skilled at sword- and word-play, master of a myriad other talents, and of Culter.